World’s Collider is a unique concept in short fiction, where all eighteen original stories are part of a common narrative, recounting the disaster and its aftermath. A true novel by many voices, including Steven Savile, James Moran, Aaron Rosenberg, Trent Zelazny, Jonathan Green, Simon Kurt Unsworth, Dave Hutchinson, Kelly Hale, Richard Wright, Jordan Ellinger and a host of new talent. “Editor Richard Salter has overseen the creation of a chilling hi-octane future in which reality has been warped into nightmare by scientific disaster. Each component cranks up the tension and the disparate tales combine in mosaic-fashion to deliver a truly gripping narrative.” – Ian Whates, author of City of Dreams and Nightmare and The Noise Within, and editor of Solaris Rising: The New Solaris Book of Science Fiction. 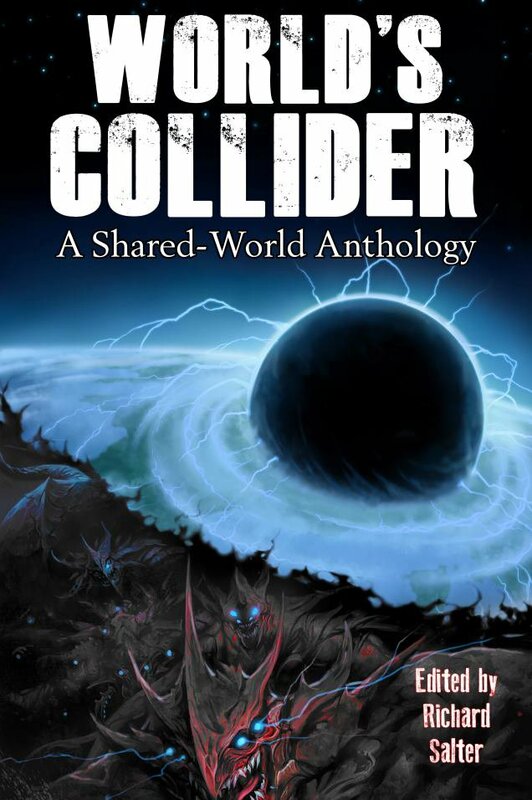 World’s Collider is available for your Kindle from Amazon UK or Amazon US. If you’d prefer a gorgeous looking trade paperback, you can order one from Amazon US, Amazon UK or direct from publishers Nightscape Press. Artwork has been provided by Carolyn Edwards and Lukas Thelin of Foxrain. Read the story behind the cover. We are running a series of interviews with World’s Collider contributors on this site and you can now read an extract from Simon Kurt Unsworth’s story, The Coming Scream. There is also a roundtable interview with nearly ALL our writers now available. If you are on Facebook, please “like” the anthology’s official page for all the latest updates, and check the news page on this site too!